Dave Schilling: Everywhere I turn these days, people are talking about the greatness of this new poster for Star Wars: The Force Awakens. Oh man, have you seen the new Star Wars poster? It’s sooooo sick. Yes, I’ve seen it. This new Star Wars poster gives me all the feels. That’s great. Hey, this gazpacho is delicious, hypothetical person. What’s your secret? Well, I chopped up pieces of the new Star Wars poster and used it as a garnish! But is it really as “sick” as your average Internet commenter would lead you to believe? Let’s investigate. Working our way up from the bottom, we start with a giant block of credits. So far, so good. This is a movie after all. Mark Hamill’s credit has been bumped from first position to second position. All the way through the original trilogy, Hamill was credited first — even in Return of the Jedi, after Harrison Ford became a giant movie star on his own in Raiders of the Lost Ark. Sorry, Mark. Surely you’ll have a nice, fat spot for your face on this poster, which should make up for all of that. Next up, it says “Star Wars,” which means my wallet has already levitated out of my back pocket and is now slowly making its way into Kathleen Kennedy’s mouth. Up next is a giant wall of Stormtroopers. This bugs me a bit, because Stormtroopers are actually very lame. Nameless, faceless foot soldiers with terrible aim are somehow a major selling point of this movie. They’re all over the promotional materials, and every other toy I see on store shelves is a damn Stormtrooper. That’s like selling a bunch of redshirt action figures in conjunction with a Star Trek movie. Or worse yet, like putting the 800 people whom Arnold Schwarzenegger slaughtered in Commando on the poster. Wait until you see Arnie throw a pipe into this guy’s chest!1 Unless they actually hit something besides the hallway of a blockade runner, I’m not buying in. If a Stormtrooper kills Han Solo, then we can talk. Captain Phasma, played by Game of Thrones’s Gwendoline Christie, is the lead Stormtrooper for the First Order.2 Perhaps she’s the one who put the scopes on their blasters and encouraged them to believe in themselves. Up higher is a whole pupu platter of characters and vehicles to warm your heart. You’ve got Han Solo, our first glimpse of Princess Leia, Chewie, some X-wing and TIE fighters, First Order Star Destroyers, the Millennium Falcon, that guy from Show Me a Hero, an unidentified little alien man, C-3PO, R2-D2, BB-8, and an explosion. Judging by their prominent placement here, our main characters are Kylo Ren (Adam Driver), a Dark Side Force user; Rey (Daisy Ridley), a scavenger from the desert planet of Jakku; and Finn (John Boyega), a former Stormtrooper who will eventually learn that the Force is strong in him. How they relate to each other (as in, are they actually related) and which sides of the Force they’ll end up on should be the focal point of the film. There’s also a giant superweapon hovering in the background, but I’ll leave that to my colleague Ben Lindbergh to discuss. I get that his appearance is supposed to be a surprise, that Luke is something of a MacGuffin for the story, and to spoil it in a poster would be a mistake. That doesn’t mean I’m not a tiny bit mystified that there’s not even a hint of Luke here. Look at the posters for the old movies. Jar Jar made it on the poster for Episode I. Darth Vader is barely in Episode III, but he’s got a very prominent spot on that poster. Someone please do the Internet a favor and Photoshop Mark Hamill onto this poster. Preferably Mark Hamill from Corvette Summer. When you’re done, please send it to me so I can print it out and frame it. Thanks. So if that ominous sphere on the upper right of the poster for The Force Awakens — which unfortunately isn’t just a giant BB-8 — were another Death Star, it would technically be the fourth of its name. Fortunately, no nerdy naming disputes need arise, since that’s not only no moon, but no Death Star. It’s almost certainly Starkiller Base, an ice planet equipped with a “fiercely destructive new weapon capable of destroying entire star systems.” Calling it a Death Star just plays into sad superweapon stereotypes: Not all planet-size battle stations with trenches and lasers look alike. It’s somewhat worrisome that director J.J. Abrams is repurposing a plot point from the original trilogy after making Star Trek Into Darkness a cover of Wrath of Khan, but there are a few reasons why another superweapon makes sense. Based on what we know about the First Order, the Nazi-inspired splinter group that controls Starkiller Base, its soldiers are super into Imperial cosplay. They’ve already got Stormtroopers, TIE fighters, and Star Destroyers, so a superlaser is necessary if they want to complete the look. Compared to other expensive weapons systems that malfunctioned or never got past the planning phase — the Crusader cannon, the Airborne Laser, or, to stick with the Star Wars theme, the Strategic Defensive Initiative — the Death Star was a stunning success. The station was supposed to blow up planets and scare local systems, and it achieved both objectives. It was also taken out by two proton torpedoes, but you can’t blame Bevel Lemelisk for failing to anticipate the Force-enhanced aim of a kid with a crazy midi-chlorian count, driven by a dead guy who kept telling him “trust me.” And that’s assuming the explosion wasn’t an inside job. Don’t get me started on the Second Death Star. The first station’s successor didn’t have the same exhaust-port problem, so all the blame lies with Palpatine’s poor planning. If they’d been given time to finish, the contractors could have closed that coolant shaft. Superweapons in Star Wars never end well, but all evidence indicates that the First Order has learned from the Empire’s Death Star–era mistakes. For one thing, it’s a planet, which is probably durable. For another, it’s more accurately named than the Death Star, which was neither a star nor a weapon capable of destroying one. Best of all, Luke Skywalker — whose original name the station stole — is absent from the poster, which suggests he won’t get enough screen time to take down First Order HQ. Skeptics look at Starkiller Base and see another Death Star–esque disaster. I see a fortress that might prove as tough to erase as Michael Arndt’s writing credit. Tyler Daswick: I’m into Rey. 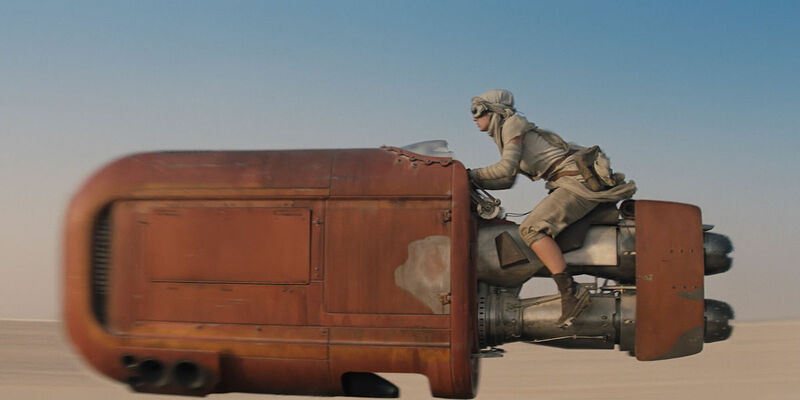 She has already charmed us with her flying Fudgsicle landspeeder and cute robot companion/hot 2015 Christmas gift item. But like mimes, people in trench coats, and the Warren Commission, I don’t know if I can trust her. She’s thrown up a clever facade, but I think Rey’s going to the Dark Side, and this poster furthers the case. For context, it’s widely held that this new trilogy, or at least Episode VII, is going to center on Han and Leia’s children. In the Expanded Universe, Han and Leia have twins, one boy and one girl. The girl becomes a Jedi while the dude turns to the Dark Side and murders a bunch of Skywalkers (the EU was raw, yo). It’s not illogical to think that Episode VII is loosely adapting this narrative. One main character is going to be a Jedi, and another main character is going to start training to become a Jedi before switching to the team with the lightning hands and the cooler lightsabers. The poster indicates the traitor is likely to be Rey. First off, she’s sporting that desperate, menacing expression. Not a good look if you’re trying to seem like a benevolent protagonist, Rey. Secondly, she’s facing the same direction as Sith-like character Kylo Ren, implying they have some common interests (i.e. chasing power, killing younglings, bringing order to the galaxy — not necessarily in that order). Her staff weapon nestles quite cozily against that imposing red lightsaber too. It’s almost like she’s holding an alternative lightsaber of her own. The nail in the coffin is Finn. Look at that blue lightsaber — he’s definitely a good guy. That’s how lightsabers work. There’s a good chance Finn and Rey will follow the structure of the EU narrative, and if we know where Finn’s loyalties are, where does that leave Rey? We’ve seen hints of the pair palling around, but this isn’t built to last. Rey’s going to the Dark Side. 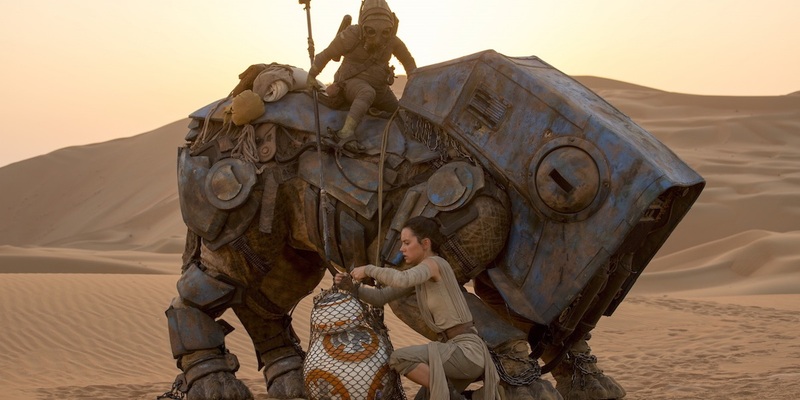 I hope she takes BB-8 with her. Jason Concepcion: As a high-functioning video-game addict and Star Wars fan, fall 2015 is a pretty incredible time to be alive. I spent the last week or so marveling at the seamless virtual cosplay and inner-child wish fulfillment supplied by the beta for the upcoming Star Wars: Battlefront. One of my earliest childhood memories is lying on my snow-covered front lawn in the muffled silence of the suburbs during a blizzard, crawling back and forth and pretending to be Luke Skywalker hallucinating Obi-Wan telling him to go to Dagobah. The adult version of that was running my Rebel soldier over the blinding white wastes of video-game Hoth, hopping in and out of trenches under Stormtrooper fire and taking the odd potshot at an AT-AT, with X-wing and TIE fighters pinwheeling in the sky overhead while John Williams’s magisterial soundtrack pounded in my headphones. All of which is to say, I don’t care about this poster. And, once the trailer drops later tonight, neither will you. 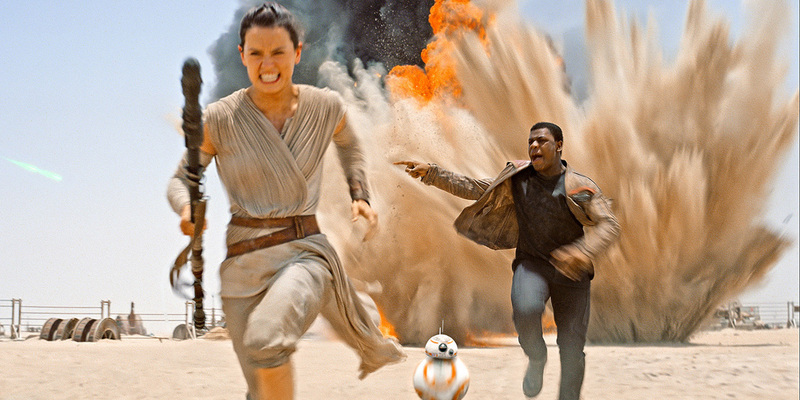 Shea Serrano: Somehow, I missed out on the Star Wars thing growing up. I didn’t see any of the first three movies when they were rereleased in theaters. I never dressed up like any of the characters while standing in a line. I never had the lunch boxes or the toys or the trading cards or the Halloween costumes or the weird fantasies about Princess Leia as I entered puberty. None of that was ever a part of my childhood or ever a meaningful part of any segment of my life, really. (I legit had to Google “Princess Leia” just now because I didn’t even know how to spell it.) The only real Star Wars memory I had was taking a girl to see The Phantom Menace when I was in high school. It was our first date. At the time, I was working at this shoe store in the mall called Wild Pair. She came in, saw another one of the guys working there (this guy, Ricardo, was far more handsome than me), called me over, then asked me to introduce her to him. I said OK, then I walked over to him by myself, asked him a question about nothing (I definitely did not say she was interested in him), then walked back over to her and said, “Sorry, he said he wasn’t interested,” and then wormed my way into a date with her instead. The movie was awful. I’m fairly sure there was a moment when she was asleep during it, and I’m all the way sure we got up and left before it was over. We didn’t even kiss or hold hands or anything. She never called me after that night. I kind of always blamed Jar Jar Binks. But now we’ve got this whole new Star Wars thing going on, and I’m not going to let my sons miss out on it. We’re going to go watch it together. I’ve been feeding them the new movie tidbits as they’ve come out, trying to build up an interest for it. I’m not sure if we’re going to watch the original movies before or after that, but I know we’re going to watch those, too. I’m excited. I think it’s going to be a good movie, and if it’s not a good movie, it’ll at least be a thing I get to do with my kids, which is big-picture good even when it’s small-picture bad. I looked that girl up on Facebook a while back when I saw a Star Wars thing on the Internet and was reminded that she existed. Her life looked like it was in total shambles. I was pretty happy about that because I am very petty. I hope Jar Jar’s life is in shambles, too. Actually, that’s kind of the selling point of Commando, now that I think about it. If you have avoided plot details until now, the First Order is the name of the new evil organization that’s taken the place of the Empire. Which also owns Grantland, as you’ll probably be tired of us telling you by December 18. This nonsensical sequence of events makes me slightly less sad that the Expanded Universe was wiped away.